Napoli have scored in each of their last 7 matches in Serie A.
Empoli have failed to win in their last 9 matches in Serie A. 70% of Napoli’s matches had over 2.5 goals scored in Serie A.
Empoli have conceded 2 goals or more in each of their last 3 matches in Serie A.
Napoli have scored 26% of their goals in the first 15 minutes in Serie A.
Empoli conceded at least 1 goal in each of their last 7 matches in Serie A. 27% of Napoli’s conceded goals occurred in the first 15 minutes in Serie A. 27% of Empoli’s conceded goals occurred in the first 15 minutes in Serie A.
Napoli have scored 32% of their goals after the 75th minute in Serie A.
Paris SG have won 100% of their matches in Ligue 1. Lille have won their last 4 matches in Ligue 1. 91% of Paris SG’s matches had over 2.5 goals scored in Ligue 1. 50% of Lille’s conceded goals occurred after the 75th minute in Ligue 1. Paris SG have scored 2 goals or more in each of their last 11 matches in Ligue 1. Paris SG have won their last 11 matches in Ligue 1. Paris SG did not concede any goal in their last 4 matches in Ligue 1. Lille have won 73% of their matches in Ligue 1. 67% of Paris SG’s conceded goals occured in the first half in Ligue 1. 33% of Paris SG’s conceded goals occurred in the first 15 minutes in Ligue 1. Paris SG have scored 33% of their goals after the 75th minute in Ligue 1. AC Ajaccio have conceded 2 goals or more in each of their last 3 matches in Ligue 2. Nancy have failed to win in their last 6 home matches in Ligue 2. 67% of Clermont’s matches had under 2.5 goals in Ligue 2. GFC Ajaccio have failed to win in their last 6 matches in Ligue 2. 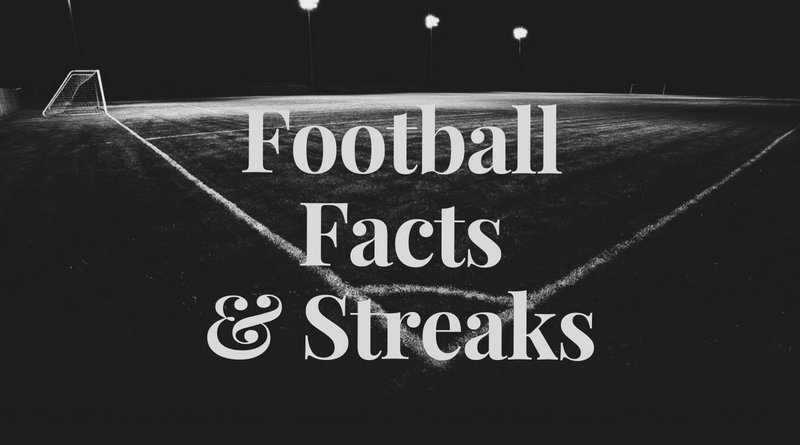 Brest have won their last 4 home matches in Ligue 2. Brest have scored 2 goals or more in each of their last 7 matches in Ligue 2. 31% of Brest’s conceded goals occurred in the first 15 minutes in Ligue 2. Red Star have lost 67% of their matches in Ligue 2. GFC Ajaccio conceded at least 1 goal in each of their last 7 matches in Ligue 2. Brest have scored in each of their last 8 matches in Ligue 2. Red Star have scored 44% of their goals after the 75th minute in Ligue 2. 75% of Nancy’s matches had under 2.5 goals in Ligue 2. 75% of Nancy’s goals have been scored in the second half in Ligue 2. Nancy have conceded the opening goal in 75% of their matches in Ligue 2. GFC Ajaccio have scored 64% of their goals in the first half in Ligue 2. Brest have been undefeated in their last 8 matches in Ligue 2. Nancy were losing at halftime in 58% of their matches in Ligue 2. 85% of Brest’s conceded goals occured in the first half in Ligue 2. Nancy have lost 75% of their matches in Ligue 2. 36% of Clermont’s conceded goals occurred after the 75th minute in Ligue 2. 67% of Stuttgart’s matches had over 2.5 goals scored in Bundesliga. 67% of Frankfurt’s matches had over 2.5 goals scored in Bundesliga. Stuttgart have conceded 2 goals or more in each of their last 3 matches in Bundesliga. 46% of Frankfurt’s conceded goals occurred after the 75th minute in Bundesliga. Stuttgart have conceded the opening goal in 78% of their matches in Bundesliga. 85% of Frankfurt’s conceded goals occured in the second half in Bundesliga. Frankfurt have scored in each of their last 9 matches in Bundesliga. Frankfurt conceded at least 1 goal in each of their last 8 matches in Bundesliga. Stuttgart have lost 67% of their matches in Bundesliga. Frankfurt were leading at halftime in 56% of their matches in Bundesliga. Frankfurt have scored in each of their last 5 away matches in Bundesliga. FC Groningen have failed to win in their last 7 matches in Eredivisie. FC Groningen conceded at least 1 goal in each of their last 7 matches in Eredivisie. Excelsior were leading at halftime in 60% of their matches in Eredivisie. FC Groningen have scored 83% of their goals in the first half in Eredivisie. FC Groningen have lost 80% of their matches in Eredivisie. Odense BK have scored 59% of their goals after the 75th minute in Superligaen. Hobro IK have conceded the opening goal in 79% of their matches in Superligaen. Vendsyssel conceded at least 1 goal in 100% of their home matches in Superligaen. SonderjyskE conceded at least 1 goal in 100% of their away matches in Superligaen. 32% of Vendsyssel’s conceded goals occurred after the 75th minute in Superligaen. SonderjyskE have scored in 71% of their away matches in Superligaen. 75% of Hobro IK’s points have been earned at home in Superligaen. Vendsyssel conceded at least 1 goal in each of their last 7 home matches in Superligaen. Hobro IK have scored in 71% of their away matches in Superligaen. Vendsyssel have scored 36% of their goals after the 75th minute in Superligaen. 71% of SonderjyskE’s points have been earned at home in Superligaen. 71% of Odense BK’s goals have been scored in the second half in Superligaen. 82% of SonderjyskE’s conceded goals were conceded away in Superligaen. Aston Villa conceded at least 1 goal in 71% of their home matches in Championship. Aston Villa have scored in 100% of their home matches in Championship. 67% of Aston Villa’s points have been earned at home in Championship. 94% of Greuther Fürth’s goals have been scored in the second half in II Bundesliga. Dynamo Dresden conceded at least 1 goal in each of their last 5 home matches in II Bundesliga. 38% of Bochum’s conceded goals occurred after the 75th minute in II Bundesliga. Sandhausen have scored 33% of their goals after the 75th minute in II Bundesliga. Greuther Fürth have scored 50% of their goals after the 75th minute in II Bundesliga. 33% of Greuther Fürth’s conceded goals occurred after the 75th minute in II Bundesliga. 41% of Sandhausen’s conceded goals occurred after the 75th minute in II Bundesliga. 83% of Galatasaray’s conceded goals were conceded away in Super Lig. 76% of Galatasaray’s goals have been scored in the second half in Super Lig. Galatasaray have scored 35% of their goals after the 75th minute in Super Lig. 33% of Galatasaray’s conceded goals occurred after the 75th minute in Super Lig. Albacete conceded at least 1 goal in each of their last 8 matches in La Liga 2. Gimnastic have scored 38% of their goals after the 75th minute in La Liga 2. Albacete have scored the opening goal in 73% of their matches in La Liga 2. Albacete have drawn their last 3 home matches in La Liga 2. Gimnastic have scored 62% of their goals in the first half in La Liga 2.